R. Jacob Post: Mail Box No More? This morning's paper has a front page story about the demise of the drop off mailbox and how some are being pulled from service and being hauled off to the scrap yard. 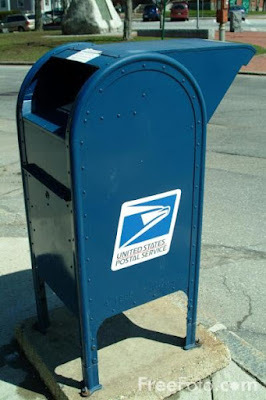 There are reports of the end of Saturday mail delivery. This is of course being blamed on the continuing growing presence of the email. Most people will not miss their mail delivery, which by the way, is in its 235 year. However, the real scourge of the mail is delivery spam! Where is the delete button? The most important function of the mail in my house is the delivery of Netflix. Yes you can stream movies online but it's just not the same, can't skip the boring parts as easily as you can on a disk. Would hate them to cut this down. Yes, how much of your mail goes unlooked at. so nice to hear from you. missed your writings. At least Netflix is mail that you want. We also do not have those little letter boxes with the flag thing on them. If we did, you can bet that some kids would pull them off. I still get plenty of mail. EBay makes sure of that. Was it the song, or the cover? Oh No! Where is the remote? Say It ain't so YouTube! Alligators and Crocodiles Oh My! A Blogger on House M.D.? Finally, Is It, Cough, Time, To Stop Smoking? A Shout Out To All My Peeps! A Follow Up To Boys Will Be Boys!